Worn At Her Wedding to Jack Haley, Jr.
LOS ANGELES- June 20th, 2018– Profiles in History is proud to announce the dates of Love, Liza: The Auction. The 3 day auction will be July 30th, 31st & August 1st, in Los Angeles. It will be over 1,700 lots from the personal and professional life of Hollywood legend, Liza Minnelli. The auction will also include items from her iconic parents, Judy Garland and Vincente Minnelli. The catalog will be available in two weeks. The auction will span Liza’s entire award-wining career in film, television, live performance and recording. 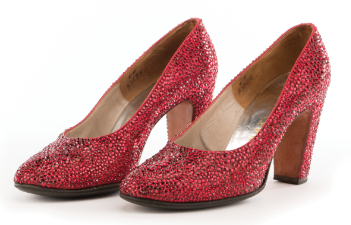 Liza’s personal tribute “Ruby Slippers” worn at her wedding to Jack Haley, Jr. (son of Jack Haley who played “The Tin Man” in The Wizard of Oz). Pictured above. The finest collection of rare and unpublished photographs in existence from the careers of Judy Garland and Vincente Minnelli. Rare and unpublished photographs of baby Liza with parents Judy Garland and Vincente Minnelli, both at work and at home. Andy Warhol color Polaroid portraits of Liza Minnelli. Annie Leibovitz monumental exhibition photograph of Liza Minnelli for Vanity Fair. Liza’s personal 1971 Rolls Royce Silver Shadow sedan. Pictured below. Liza’s personal hand-annotated book bound shooting script for Cabaret. Liza’s “Sally Bowles” Cabaret performance ensemble, bowler hat, boots and jewelry. Pictured right. An extensive showcase of trendsetting custom fashions by Roy Halston Frowick. Halston, who launched his womenswear label in 1968, came to define American Style in the 1970s with his hip, urban chic designs worn most prominently by friend, muse, and fellow Studio 54 habitué, Liza Minnelli. Liza’s elaborately beaded wedding gown by Bob Mackie for her wedding to David Gest. Liza’s antique French arm chairs. Liza’s personal set of Louis Vuitton luggage. Vincente Minnelli’s “Best Director” Academy Award nomination plaque for An American in Paris. Vincente Minnelli’s “Best Director” Golden Globe nomination certificate for Gigi. Vincente Minnelli’s Screen Directors Guild “Most Outstanding Achievement in Directing” award for Gigi. Vincent Minnelli’s three Screen Directors Guild “Outstanding Directorial Achievement” award medallions for Father’s Little Dividend, An American in Paris andGigi. Vincente Minnelli’s three DGA Award nomination plaques for Gigi,Home from the Hill, and Bells Are Ringing. Vincente Minnelli’s 1959 Best Director Oscar scrapbook filled with celebrity congratulations. Letters to Vincente Minnelli from Gene Kelly, Fred Astaire, David Lean, Walter Huston, Gregory Peck, Kirk Douglas, Lauren Bacall. Vincente Minnelli’s personal drawings done in various mixed media, his easel, painters palette and brushes. Vincente Minnelli’s personal Hollywood Walk of Fame star plaque. Judy Garland’s personal handwritten notes to husband Vincente Minnelli — filled with love and admiration. 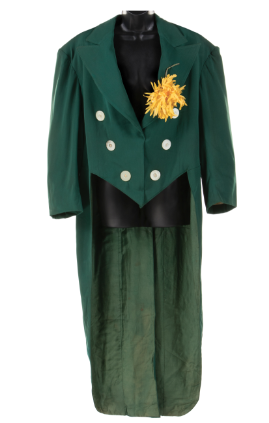 Judy Garland’s tramp clown tailcoat from a portrait sitting with Richard Avedon. Pictured right. Judy Garland’s 16mm prints of her films, concert programs and sheet music. 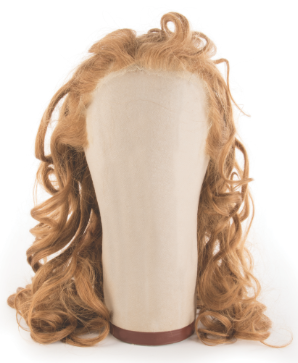 Judy Garland ‘s “Dorothy Gale” wig from the first week of shooting on The Wizard of Oz — gifted to Liza by famed Hollywood hair stylist Sydney Guilaroff. Pictured below.